"Broken bones" redirects here. For other uses, see Broken Bones. A bone fracture (sometimes abbreviated FRX or Fx, Fx, or #) is a medical condition in which there is a partial or complete break in the continuity of the bone. In more severe cases, the bone may be broken into several pieces. A bone fracture may be the result of high force impact or stress, or a minimal trauma injury as a result of certain medical conditions that weaken the bones, such as osteoporosis, osteopenia, bone cancer, or osteogenesis imperfecta, where the fracture is then properly termed a pathologic fracture. Both high- and low-force trauma can cause bone fracture injuries. Preventive efforts to reduce motor vehicle crashes, the most common cause of high-force trauma, include reducing distractions while driving. Common distractions are driving under the influence and texting or calling while driving, both of which lead to an approximate 6-fold increase in crashes. Wearing a seatbelt can also reduce the likelihood of injury in a collision. A common cause of low-force trauma is an at-home fall. When considering preventative efforts, the National Institute of Health (NIH) examines ways to reduce the likelihood of falling, the force of the fall, and bone fragility. To prevent at-home falls they suggest keeping cords out of high-traffic areas where someone could trip, installing handrails and keeping stairways well-lit, and installing an assistive bar near the bathtub in the washroom for support. To reduce the impact of a fall the NIH recommends to try falling straight down on your buttocks or onto your hands. Finally, taking calcium vitamin D supplements can help strengthen your bones. Breaking in the continuity of the periosteum, with or without similar discontinuity in endosteum, as both contain multiple pain receptors. Edema of nearby soft tissues caused by bleeding of broken periosteal blood vessels evokes pressure pain. Involuntary muscle spasms trying to hold bone fragments in place. Hematoma on the fracture site. Damage to adjacent structures such as nerves, muscles or blood vessels, spinal cord, and nerve roots (for spine fractures), or cranial contents (for skull fractures) may cause other specific signs and symptoms. Some fractures may lead to serious complications including a condition known as compartment syndrome. 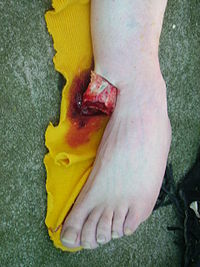 If not treated, eventually, compartment syndrome may require amputation of the affected limb. Other complications may include non-union, where the fractured bone fails to heal or mal-union, where the fractured bone heals in a deformed manner. Immediate complications – occurs at the time of the fracture. Early complications – occurring in the initial few days after the fracture. Late complications – occurring a long time after the fracture. The natural process of healing a fracture starts when the injured bone and surrounding tissues bleed, forming a fracture hematoma. The blood coagulates to form a blood clot situated between the broken fragments. Within a few days, blood vessels grow into the jelly-like matrix of the blood clot. The new blood vessels bring phagocytes to the area, which gradually removes the non-viable material. The blood vessels also bring fibroblasts in the walls of the vessels and these multiply and produce collagen fibres. In this way, the blood clot is replaced by a matrix of collagen. Collagen's rubbery consistency allows bone fragments to move only a small amount unless severe or persistent force is applied. At this stage, some of the fibroblasts begin to lay down bone matrix in the form of collagen monomers. These monomers spontaneously assemble to form the bone matrix, for which bone crystals (calcium hydroxyapatite) are deposited in amongst, in the form of insoluble crystals. This mineralization of the collagen matrix stiffens it and transforms it into bone. In fact, bone is a mineralized collagen matrix; if the mineral is dissolved out of bone, it becomes rubbery. Healing bone callus on average is sufficiently mineralized to show up on X-ray within 6 weeks in adults and less in children. This initial "woven" bone does not have the strong mechanical properties of mature bone. By a process of remodelling, the woven bone is replaced by mature "lamellar" bone. The whole process may take up to 18 months, but in adults, the strength of the healing bone is usually 80% of normal by 3 months after the injury. Several factors may help or hinder the bone healing process. For example, tobacco smoking hinders the process of bone healing, and adequate nutrition (including calcium intake) will help the bone healing process. Weight-bearing stress on bone, after the bone has healed sufficiently to bear the weight, also builds bone strength. Although there are theoretical concerns about NSAIDs slowing the rate of healing, there is not enough evidence to warrant withholding the use of this type analgesic in simple fractures. Smokers generally have lower bone density than non-smokers, so they have a much higher risk of fractures. There is also evidence that smoking delays bone healing. A bone fracture may be diagnosed based on the history given and the physical examination performed. Radiographic imaging often is performed to confirm the diagnosis. Under certain circumstances, radiographic examination of the nearby joints is indicated in order to exclude dislocations and fracture-dislocations. In situations where projectional radiography alone is insufficient, Computed Tomography (CT) or Magnetic Resonance Imaging (MRI) may be indicated. "Compound Fracture" redirects here. For the 2013 horror film, see Compound Fracture (film). In orthopedic medicine, fractures are classified in various ways. Historically they are named after the physician who first described the fracture conditions, however, there are more systematic classifications as well. They may be divided into stable versus unstable depending on the likelihood that they may shift further. Traumatic fracture – This is a fracture due to sustained trauma. e.g., fractures caused by a fall, road traffic accident, fight, etc. Pathologic fracture – A fracture through a bone that has been made weak by some underlying disease is called pathological fracture. e.g., a fracture through a bone weakened by metastasis. Osteoporosis is the most common cause of pathological fracture. Open/compound fractures involve wounds that communicate with the fracture, or where fracture hematoma is exposed, and may thus expose bone to contamination. Open injuries carry a higher risk of infection. Translated, or ad latus, with sideways displacement. Incomplete fracture: Is a fracture in which the bone fragments are still partially joined, in such cases, there is a crack in the osseous tissue that does not completely traverse the width of the bone. Complete fracture: Is a fracture in which bone fragments separate completely. Comminuted fracture: Is a fracture in which the bone has broken into several pieces. An anatomical classification may begin with specifying the involved body part, such as the head or arm, followed with more specific localization. Fractures that have additional definition criteria than merely localization often may be classified as subtypes of fractures, such as a Holstein-Lewis fracture being a subtype of a humerus fracture. Most typical examples in an orthopaedic classification given in the previous section cannot be classified appropriately into any specific part of an anatomical classification, however, as they may apply to multiple anatomical fracture sites. Le Fort fracture of skull – facial fractures involving the maxillary bone and surrounding structures in a usually bilateral and either horizontal, pyramidal, or transverse way. The Orthopaedic Trauma Association Committee for Coding and Classification published its classification system  in 1996, adopting a similar system to the 1987 AO Foundation system. In 2007, they extended their system, unifying the two systems regarding wrist, hand, foot, and ankle fractures. A number of classifications are named after the person (eponymous) who developed it. Treatment of bone fractures are broadly classified as surgical or conservative, the latter basically referring to any non-surgical procedure, such as pain management, immobilization or other non-surgical stabilization. A similar classification is open versus closed treatment, in which open treatment refers to any treatment in which the fracture site is opened surgically, regardless of whether the fracture is an open or closed fracture. In arm fractures in children, ibuprofen has been found to be as effective as a combination of acetaminophen and codeine. Since bone healing is a natural process that will occur most often, fracture treatment aims to ensure the best possible function of the injured part after healing. Bone fractures typically are treated by restoring the fractured pieces of bone to their natural positions (if necessary), and maintaining those positions while the bone heals. Often, aligning the bone, called reduction, in a good position and verifying the improved alignment with an X-ray is all that is needed. This process is extremely painful without anaesthesia, about as painful as breaking the bone itself. To this end, a fractured limb usually is immobilized with a plaster or fibreglass cast or splint that holds the bones in position and immobilizes the joints above and below the fracture. When the initial post-fracture oedema or swelling goes down, the fracture may be placed in a removable brace or orthosis. If being treated with surgery, surgical nails, screws, plates, and wires are used to hold the fractured bone together more directly. Alternatively, fractured bones may be treated by the Ilizarov method which is a form of an external fixator. Occasionally smaller bones, such as phalanges of the toes and fingers, may be treated without the cast, by buddy wrapping them, which serves a similar function to making a cast. A device called a Suzuki frame may be used in cases of deep, complex intra-articular digit fractures. By allowing only limited movement, immobilization helps preserve anatomical alignment while enabling callus formation, toward the target of achieving union. Splinting results in the same outcome as casting in children who have a distal radius fracture with little shifting. Surgical methods of treating fractures have their own risks and benefits, but usually surgery is performed only if conservative treatment has failed, is very likely to fail, or likely to result in a poor functional outcome. 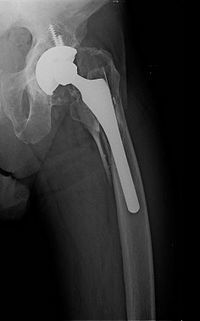 With some fractures such as hip fractures (usually caused by osteoporosis), surgery is offered routinely because non-operative treatment results in prolonged immobilisation, which commonly results in complications including chest infections, pressure sores, deconditioning, deep vein thrombosis (DVT), and pulmonary embolism, which are more dangerous than surgery. When a joint surface is damaged by a fracture, surgery is also commonly recommended to make an accurate anatomical reduction and restore the smoothness of the joint. Infection is especially dangerous in bones, due to the recrudescent nature of bone infections. Bone tissue is predominantly extracellular matrix, rather than living cells, and the few blood vessels needed to support this low metabolism are only able to bring a limited number of immune cells to an injury to fight infection. For this reason, open fractures and osteotomies call for very careful antiseptic procedures and prophylactic use of antibiotics. Occasionally, bone grafting is used to treat a fracture. Sometimes bones are reinforced with metal. These implants must be designed and installed with care. Stress shielding occurs when plates or screws carry too large of a portion of the bone's load, causing atrophy. This problem is reduced, but not eliminated, by the use of low-modulus materials, including titanium and its alloys. The heat generated by the friction of installing hardware can accumulate easily and damage bone tissue, reducing the strength of the connections. If dissimilar metals are installed in contact with one another (i.e., a titanium plate with cobalt-chromium alloy or stainless steel screws), galvanic corrosion will result. The metal ions produced can damage the bone locally and may cause systemic effects as well. A Cochrane review of low-intensity pulsed ultrasound to speed healing in newly broken bones found insufficient evidence to justify routine use. Other reviews have found tentative evidence of benefit. It may be an alternative to surgery for established nonunions. Vitamin D supplements combined with additional calcium marginally reduces the risk of hip fractures and other types of fracture in older adults; however, vitamin D supplementation alone did not reduce the risk of fractures. In children, whose bones are still developing, there are risks of either a growth plate injury or a greenstick fracture. 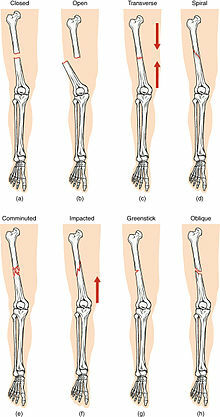 A greenstick fracture occurs due to mechanical failure on the tension side. That is since the bone is not so brittle as it would be in an adult, it does not completely fracture, but rather exhibits bowing without complete disruption of the bone's cortex in the surface opposite the applied force. Growth plate injuries, as in Salter-Harris fractures, require careful treatment and accurate reduction to make sure that the bone continues to grow normally. Plastic deformation of the bone, in which the bone permanently bends, but does not break, also is possible in children. These injuries may require an osteotomy (bone cut) to realign the bone if it is fixed and cannot be realigned by closed methods. Certain fractures mainly occur in children, including fracture of the clavicle and supracondylar fracture of the humerus. ^ Katherine, Abel (2013). Official CPC Certification Study Guide. American Medical Association. p. 108. ^ Witmer, Daniel K.; Marshall, Silas T.; Browner, Bruce D. (2016). "Emergency Care of Musculoskeletal Injuries". In Townsend, Courtney M.; Beauchamp, R. Daniel; Evers, B. Mark; Mattox, Kenneth L. (eds.). Sabiston Textbook of Surgery (20th ed.). Elsevier. pp. 462–504. ISBN 978-0-323-40163-0. ^ a b "Open Fractures - OrthoInfo - AAOS". Retrieved 2018-12-03. ^ a b Court-Brown, Charles M.; Bugler, Kate E.; Clement, Nicholas D.; Duckworth, Andrew D.; McQueen, Margaret M. (June 2012). "The epidemiology of open fractures in adults. A 15-year review". Injury. 43 (6): 891–897. doi:10.1016/j.injury.2011.12.007. ISSN 1879-0267. PMID 22204774. ^ a b c Sidwell, Richard; Matar, Maher M.; Sakran, Joseph V. (2017-10-01). "Trauma Education and Prevention". Surgical Clinics of North America. 97 (5): 1185–1197. doi:10.1016/j.suc.2017.06.010. ISSN 0039-6109. PMID 28958365. ^ a b c d "Preventing Falls and Related Fractures | NIH Osteoporosis and Related Bone Diseases National Resource Center". www.bones.nih.gov. Retrieved 2018-12-03. ^ MedicineNet – Fracture Archived 2008-12-21 at the Wayback Machine Medical Author: Benjamin C. Wedro, MD, FAAEM. ^ Sloan, A.; Hussain, I.; Maqsood, M.; Eremin, O.; El-Sheemy, M. (2010). "The effects of smoking on fracture healing". The Surgeon. 8 (2): 111–6. doi:10.1016/j.surge.2009.10.014. PMID 20303894. ^ Pountos, Ippokratis; Georgouli, Theodora; Calori, Giorgio M.; Giannoudis, Peter V. (2012). "Do Nonsteroidal Anti-Inflammatory Drugs Affect Bone Healing? A Critical Analysis". The Scientific World Journal. 2012: 1–14. doi:10.1100/2012/606404. PMC 3259713. PMID 22272177. ^ Kanis, J. A.; Johnell, O.; Oden, A.; Johansson, H.; De Laet, C.; Eisman, J. A.; Fujiwara, S.; Kroger, H.; McCloskey, E. V.; Mellstrom, D.; Melton, L. J.; Pols, H.; Reeve, J.; Silman, A.; Tenenhouse, A. (2004). "Smoking and fracture risk: A meta-analysis". Osteoporosis International. 16 (2): 155–62. doi:10.1007/s00198-004-1640-3. PMID 15175845. ^ Roberto Schubert. "Fractures of the extremities (general rules and nomenclature)". Radiopaedia. Retrieved 2018-02-21. ^ a b Hunter, Tim B.; Peltier, Leonard F.; Lund, Pamela J. (2000). "Radiologic History Exhibit". RadioGraphics. 20 (3): 819–36. doi:10.1148/radiographics.20.3.g00ma20819. PMID 10835130. ^ Mellick, Larry B.; Milker, Laura; Egsieker, Erik (1999). "Childhood accidental spiral tibial (CAST) fractures". Pediatric Emergency Care. 15 (5): 307–9. doi:10.1097/00006565-199910000-00001. PMID 10532655. ^ Perry, C. R.; Rice, S; Rao, A; Burdge, R (1983). "Posterior fracture-dislocation of the distal part of the fibula. Mechanism and staging of injury". The Journal of Bone and Joint Surgery. American Volume. 65 (8): 1149–57. doi:10.2106/00004623-198365080-00016. PMID 6630259. ^ "Fracture and dislocation compendium. Orthopaedic Trauma Association Committee for Coding and Classification". Journal of Orthopaedic Trauma. 10 Suppl 1: v–ix, 1–154. 1996. PMID 8814583. ^ Marsh, J. L.; Slongo, T. F.; Agel, J; Broderick, J. S.; Creevey, W; Decoster, T. A.; Prokuski, L; Sirkin, M. S.; Ziran, B; Henley, B; Audigé, L (2007). "Fracture and dislocation classification compendium - 2007: Orthopaedic Trauma Association classification, database and outcomes committee". Journal of Orthopaedic Trauma. 21 (10 Suppl): S1–133. doi:10.1097/00005131-200711101-00001. PMID 18277234. ^ "Denis classification of spinal fractures". GPnotebook. ^ Rüedi, etc. all; Thomas P. Rüedi; Richard E. Buckley; Christopher G. Moran (2007). AO principles of fracture management, Volume 1. Thieme. p. 96. ISBN 978-3-13-117442-0. ^ "Fractures of the Acetabulum". wheelessonline.com. Archived from the original on 2009-09-26. ^ Mourad, L (1997). "Neer classification of fractures of the proximal humerus". Orthopedic Nursing. 16 (2): 76. PMID 9155417. ^ Drendel, Amy L.; Gorelick, Marc H.; Weisman, Steven J.; Lyon, Roger; Brousseau, David C.; Kim, Michael K. (2009). "A Randomized Clinical Trial of Ibuprofen Versus Acetaminophen with Codeine for Acute Pediatric Arm Fracture Pain". Annals of Emergency Medicine. 54 (4): 553–60. doi:10.1016/j.annemergmed.2009.06.005. PMID 19692147. ^ Keramidas EG, Miller G (October 2005). "The Suzuki frame for complex intraarticular fractures of the thumb". Plastic and Reconstructive Surgery. 116 (5): 1326–31. doi:10.1097/01.prs.0000181786.39062.0b. PMID 16217475. ^ Boutis, K.; Willan, A.; Babyn, P.; Goeree, R.; Howard, A. (2010). "Cast versus splint in children with minimally angulated fractures of the distal radius: A randomized controlled trial". Canadian Medical Association Journal. 182 (14): 1507–12. doi:10.1503/cmaj.100119. PMC 2950182. PMID 20823169. ^ Griffin, XL; Parsons, N; Costa, ML; Metcalfe, D (23 June 2014). "Ultrasound and shockwave therapy for acute fractures in adults". The Cochrane Database of Systematic Reviews (6): CD008579. doi:10.1002/14651858.CD008579.pub3. PMID 24956457. ^ Lou, S.; Lv, H.; Li, Z.; Zhang, L.; Tang, P (1 September 2017). "The effects of low-intensity pulsed ultrasound on fresh fracture: A meta-analysis". Medince. 96 (39): e8181. doi:10.1097/MD.0000000000008181. PMC 5626319. PMID 28953676. ^ Leighton, R.; Watson, J.T; Giannoudis, P.; Papakostidis, C.; Harrison, A.; Steen, R.G. (May 2017). "Healing of fracture nonunions treated with low-intensity pulsed ultrasound (LIPUS): A systematic review and meta-analysis". Injury. 48 (7): 1339–1347. doi:10.1016/j.injury.2017.05.016. PMID 28532896. ^ Avenell, Alison; Mak, Jenson C. S.; O'Connell, Dianne (2014-04-14). "Vitamin D and vitamin D analogues for preventing fractures in post-menopausal women and older men". The Cochrane Database of Systematic Reviews (4): CD000227. doi:10.1002/14651858.CD000227.pub4. ISSN 1469-493X. PMID 24729336. Wikimedia Commons has media related to Bone fractures.